Item 006 - Summer home on the French River near North Bay, Ont., Canada. 109.914 JN. Published by H. S. Campbell, Druggist, North Bay, Ont. 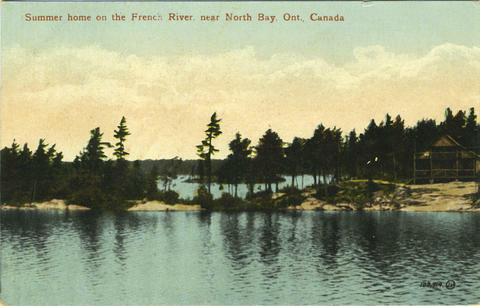 Item is a postally used postcard depicting the French River and a cottage barely visible on shore. Message reads: North Bay. 8 a.m. Running pretty well on time & everything o.k. Postmark is not legible. Addressed to: G. Simpson We?gg, St. Thomas, Ont., 69 Southwick St.